Whether you’re a high school freshman or a college senior, we are excited to welcome you to the agricultural education profession! If you want to make a difference, ignite leadership, share your passion, strengthen agriculture, and to change lives, teaching agriculture is the perfect career choice for you! The difference and the impact you will make as a future agriculture teacher will be endless. On this page, you will find resources, tips and ideas to successfully prepare you for an exciting career in agricultural education. Also, make sure to check out our Future Teacher Webinars for more information about becoming an agriculture teacher! From the moment you walked into eighth grade career day, the question about what you want to do when you grow up is constantly being asked. Again, we are excited that you have decided to teach agriculture at such an early stage of your professional career. While you are still in high school, here are some things to consider to develop a firm foundation for your path toward a career in agricultural education. One of the best ways to finance your post-secondary education is to apply for as many scholarships as you possibly can. Every year, thousands of dollars in scholarships go unclaimed simply because no one takes the time to fill them out. Even an hour of searching for scholarships can yield all types of scholarship opportunities. However, start looking as soon as possible! Starting your search early will ensure you have the best selection of scholarships to apply for along with time to complete your applications. For more tips and suggestions, here are 12 Tips for Winning a Scholarship. It’s never to early to create a resume! A resume is simply a document that is used to present your education, work experience, and accomplishments when applying for jobs. While there is a lot information and opinions on the internet about resumes, here are some helpful resume tips to help you get started. Just remember that keeping your resume up-to-date is an unending task; as you grow as a professional and add more experiences and receive additional duties, your resume should reflect these changes. To get started with your resume, here’s a FREE Resume Builder offered by LiveCareer. In addition, you can follow this link for a resume guide geared specifically for teachers. If you’re thinking about teaching agriculture, then have a conversation about it with your own agriculture teacher! You can ask him or her questions about your path to joining the profession, where he or she went to school, or what his or her job is like. Additionally, your agriculture teacher might be willing to schedule a job shadowing or an internship experience for you. Finally, you might be able to develop an SAE that involves agricultural education and participate in the FFA agricultural education proficiency award or career development event with his or her guidance. If you don’t have an agriculture teacher where you go to school there are more than 11,000 agriculture teachers who would be willing to host you or talk with you. Contact the state agriculture teachers association president to find one near you. With your high school diploma under your belt, you’re officially one step closer to becoming an agriculture teacher. College is an exciting time of your life where you’ll have the opportunity to meet new friends, build your professional network, and make life-long memories, However, it’s also an important preparation step in your goal of becoming an agriculture teacher. Here are a handful of things to take into consideration while in college. “Going to college is not the same as being successful in college and completing a college degree,” says Lori Grandstaff, Vice President of WiseChoice. Regardless of what school you will someday call your alma mater, it’s important to be successful in college so you can someday become a successful agriculture teacher. Make your college education your #1 job. Learn how to organize and manage your time. One of the worst places to study may be where you live. Treat college like an 8-hour/day and a 40-hour/week job. To read all 10 ways to be a successful first year college student, click here. Every year, the National Teach Ag Campaign selects 12 passionate, enthusiastic individuals to serve as National Teach Ag Ambassadors. Teach Ag Ambassadors are responsible for communicating with a variety of audiences to recruit future agriculture teachers and to spread the Teach Ag message. This program is for individuals who are passionate about agricultural education and want to share their story as they use their enthusiasm to encourage others to consider a career in teaching agriculture. Click here to learn more about the application process! Applications are due in March every year. As the start of your career as an agriculture teacher gets closer and closer, it’s a good idea to shadow multiple agriculture teachers for a day or two to get a better understanding of where you want to teach. If you graduated from a traditional high school agriculture program, it might be a good idea to shadow an agriculture teacher who works at a career center. If your home program primarily focused on horticulture and plant science, exposing yourself to programs that teach different courses isn’t a bad idea either. To get some ideas of teachers who you might consider shadowing, talk to your agriculture teacher, your state’s supervisor of agricultural education or your college advisor. If you ask any teacher who has ever student taught before, they will tell you that the experience comes with numerous joys and triumphs and a handful of challenges and frustrations. The National Teach Ag Campaign believes that a successful student teaching experience is a key component to starting a successful career in agricultural education. To learn more about how to get the most out of your time as a student teacher, click here to listen to a past Teach Ag webinar with guest speakers Mr. Matthew Eddy from Southeast Polk High School in Iowa and Mrs. Rachel Sauvola from New Richmond High School in Wisconsin. Student teaching can sometimes be a financial burden, but resources do exist to help! Click here to apply for the NAAE Upper Division Scholarship for students completing their student teaching experience. The National Association of Agricultural Educators is a group comprised of agricultural educators across the country that advocate for the profession. NAAE membership can begin during college for students studying agricultural education. Benefits include professional development opportunities, scholarships and more. It’s a great way to start building a strong network of agricultural education professionals before you start your career! Click here to sign up for NAAE student membership. Also, don’t forget to start a membership with your state affiliate to receive even more benefits. Wait to buy your textbooks. To read all ten tips, click here. There are also federal programs to help future teachers pay for their schooling. The Teacher Education Assistance for College and Higher Education (TEACH) Grant can assist you in paying for college in a high-need field in a low--income area. For the majority of states, agricultural education is considered a high-need field. To get more information and apply for the grant, click here. Perhaps you’ve spent your entire college career thinking about the moment when you will finally be able to interview for your first teaching job. Although you may have been through interviews before, being mentally prepared for success during your interview is easier said than done. There’s a lot to think about before entering the interview room – from your posture and clothing to your answers to the questions and following up with the interviewer. Here are a handful of websites to visit to make sure you are full prepared to master your interview. Another crucial part of obtaining your first teaching position is developing an outstanding portfolio for your interview committee to review. Check out these links for some guiding tips, samples and much more! In addition to these great resources, you can also find a portfolio generator to help you get started by clicking here. Also, check out the book, The First Days of School: How to Be an Effective Teacher by Harry K. Wong and Rosemary T. Wong. You can click here to order it directly from Amazon! 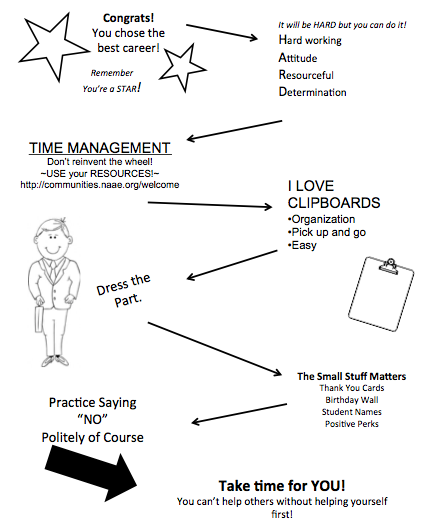 For more resources for your classroom, click here to check out the NAAE Pinterest page!